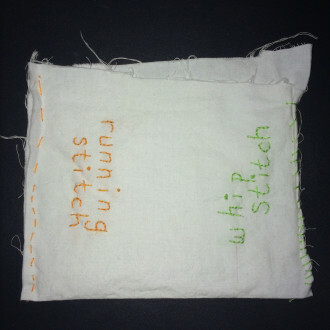 This pocket illustrates a running stitch (left, orange) and a whip stitch (right, green). ​​When visitors sew for the first time, they often worry about the tools, like how to thread a needle and whether they’re going to poke themselves with the needle once it’s threaded. 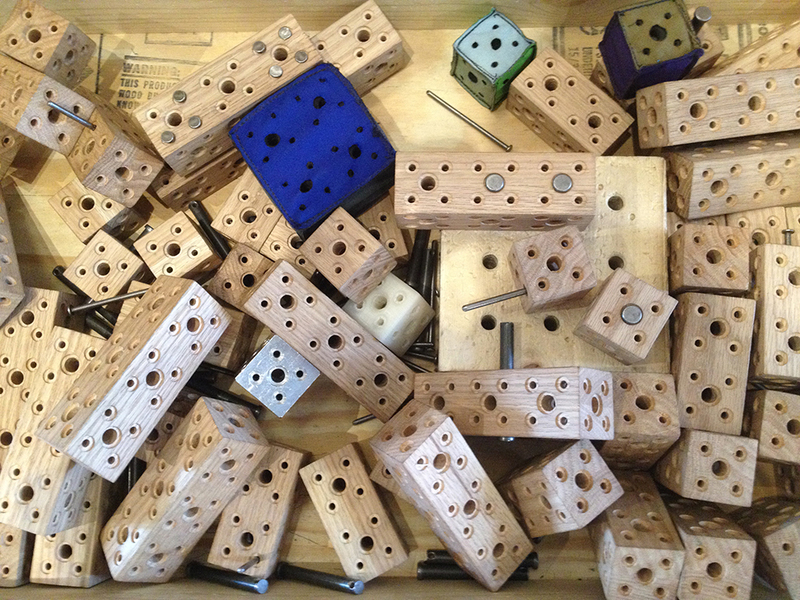 Once they start, however, they shift their focus to making a stitch. 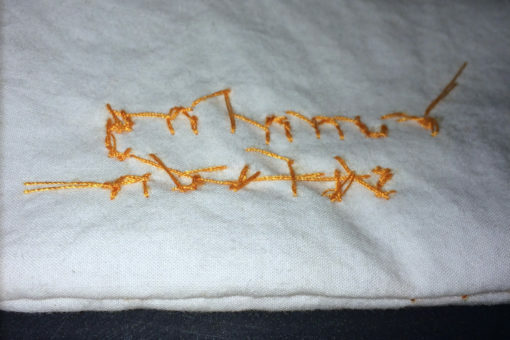 There are lots of ways to make a stitch, but there are two stitches that new sewers tend to start with: the running stitch and the whip stitch. Both are useful and can create strong attachments, and you’ve probably seen both before. 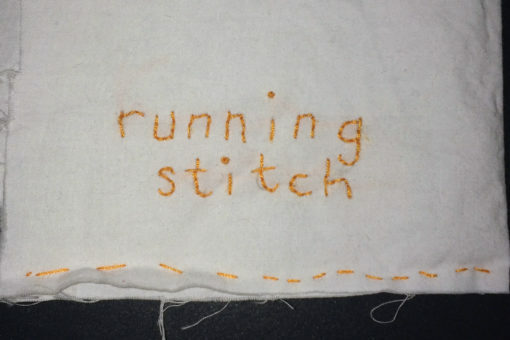 A running stitch is made with an up-down-up-down/in-out-in-out pattern. Some people think of it as imagining a dolphin diving in and out of water. After you push the needle down through fabric and pull it all the way through on the other (back or bottom) side, you push the needle back up to the side where it started (the front or the top). By keeping the stitches small and close together, you can create a strong attachment. The running stitch employs an up-down-up-down motion that requires the sewer to alternate sides while poking the needle through. The inverse of the running stitch attachment is mostly invisible, especially when stitches are small and close together. Sometimes, hiding stitches is desirable, either for a more polished-looking finished product or to hide any knots or mistakes that occurred in the sewing process. After sewing two pieces together, you can turn your piece inside out (just as you might reverse a sock) to move the most visible stitches to the inside. 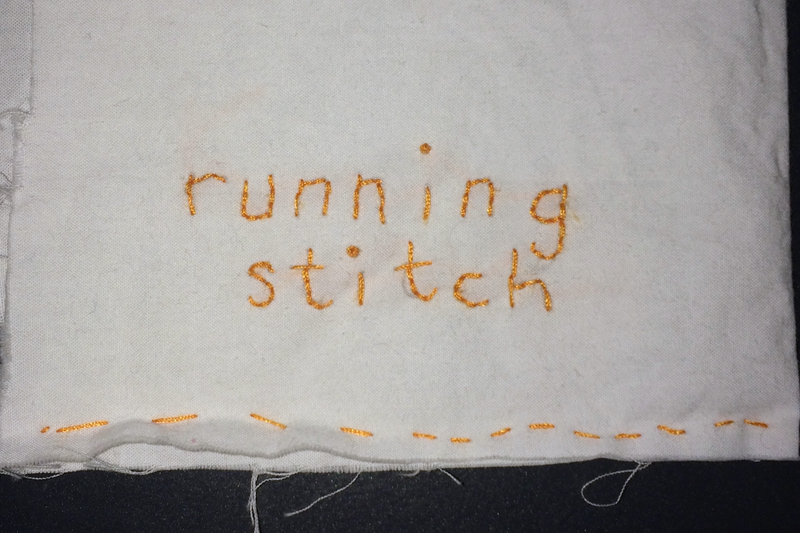 Once inverted, the running stitch creates a smooth look, with the folds of the fabric showing instead of the stitches. In the example above, the running stitch was used to make a pocket, but the same rules apply when making a pillow, stuffed animal, or bag. It’s important to decide whether you’re going to sew a piece inside out ahead of time, though, because if you incorporate embroidery or appliqué you want to make sure your designs are on the side opposite your most visible attachment stitches. 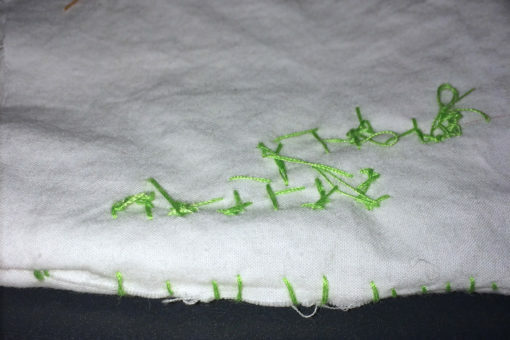 On the other hand, the whip stitch can be a fun and fast way to finish hems or attach pieces of fabric, and is often simpler for young sewers learning how to stitch. 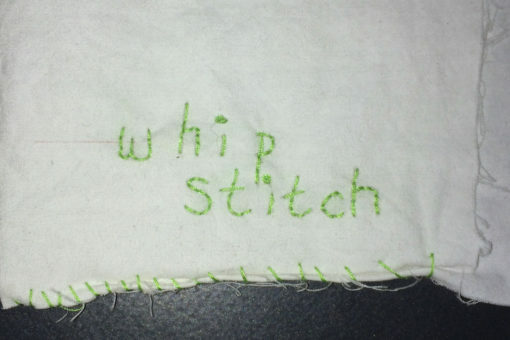 When making a whip stitch, you don’t have to go up-down-up-down, alternating sides as you poke your needle through. Instead, you can keep poking your needle on the same side of the fabric, looping your thread around the edge of your fabric and coming back to where you started. This motion allows a sewer to hold the fabric steady and poke the needle through on one side, instead of remembering which side to poke the needle through as one would with the running stitch. Many young sewers naturally create a whip stitch. The whip stitch (on the bottom edge of the fabric) employs a loop around motion that requires the sewer to poke the needle through the same side of the fabric each time. A whip stitch is visible both inside and out. Depending on how close together your stitches are, the whip stitch can create a strong attachment. However, a whip stitch looks the same both inside and out, so it isn’t the best stitch to try if you want to hide stitches on a project. Still, they make a nice decoration and take on a curvy, looped shape along the edge of fabric. No matter what stitch you choose to try or teach, you’re bound to create a cool attachment and look! You can even experiment with these two styles by mixing which kinds of stitches you use on one project, as the example here illustrates.